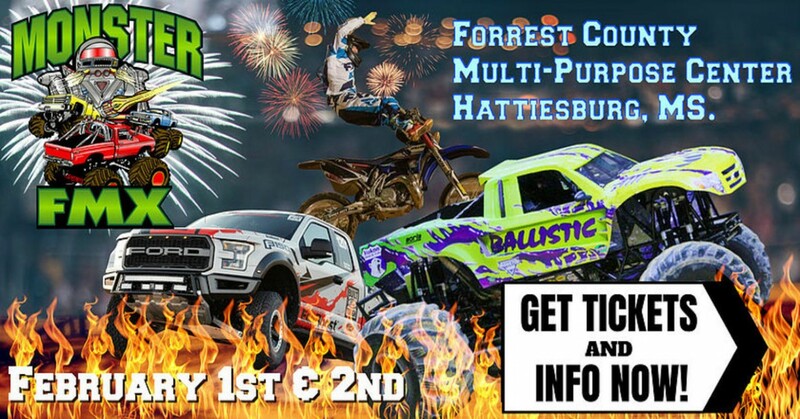 MONSTER TRUCKS...SEE 10,000 POUND MEGA-POWERED MONSTER TRUCKS BATTLE IN WHEELIE, SIDE X SIDE RACING AND OUTRAGEOUS FREESTYLE COMPETITION. PRO FMX MOTOCROSS JUMPERS...YOU'VE SEEN THEM ON TV, NOW SEE THEM JUMP INTO REALITY. HIGH-FLYING FREESTYLE MOTOCROSS JUMPERS ROCKETING OVER THREE STORIES INTO THE AIR DOING AMAZING TRICKS AND BACK FLIPS! TUFF TRUCKS...HERE THEY COME! SMASH AND CRASH 4X4 TUFF TRUCKS! IT'S A 4X4 WAR ON THE FLOOR WHEN OUTRAGEOUS AND DANGEROUS TUFF TRUCKS BATTLE OBSTACLE COURSE BUMPS, JUMPS AND HAIR PIN TURNS!